Recent studies are now lending scientific weight to the belief dogs really can pick up on human emotions and interpret what we are thinking. But what about the other way around? The Facial Action Coding System has been around since the 1970s and taxonomizes all the expressions a human face can make. But the Dog Facial Action Coding System (DogFACS) has been adapted from the original FACS system and seeks to identify and code facial movements in dogs based on their anatomy. it does not detect emotions, but enables the the user to “code the unitary facial movements of dogs in detail, with no a priori assumptions about what represents a facial expression in this species… without emotional context biases.” This is important to avoid subjective anthropomorphism (the attribution of human characteristics or behavior to a god, animal, or object). The DogFACS Manual and the DogFACS Test are freely available through the website at dogfacs.com. Registration is required to actually download the full PDF manual. While research in DogFACS is relatively new, scientists have so far identified 16 independent facial and ear movements. There are 11 movements of facial muscles involved in expressions. They are called “action units” or AUs. There are also five Ear Action Descriptors (EADs), since ear movements are integral to a dog’s facial expressions. According to Juliane Kaminski of the University of Portsmouth, “We have the same problem as studies of human faces — we tend to interpret, but not describe. People say that dogs look sad, or happy, or guilty — but how many of these assessments come from a human point of view, instead of the dog’s?” DogFACS is an objective tool to first catalog movements and then use to interpret those expressions. The lone study based on DogFACS in a real-life context to be published involved 27 shelter dogs and their interactions with strangers. One very interesting observation among many was the effect of “puppy dog eyes.” Raising of the inner eyebrows (or code AU101 in science=speak) correlated with speed of adoption. Dogs who made that face more often during initial contact found homes the fastest. 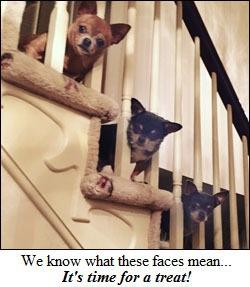 and the underlying facial muscles in humans  and dogs. So what about some of the residents in the Newcomb household? Carl has the best angry face, all teeth and bug eyes. But he also looks like the old movie star, Peter Lorre. Penny has the best sad face – she could be on TV representing shelter dogs (she was one). Jacques is so cute when you pet him, he squints and looks so happy. Yoshi has the best “I don’t care” face. Japanese Chins can be aloof. Frasier always looks a little anxious. Ted has a “melt your heart” face. Gypsy loves my husband and gazes at him with total devotion. Their expressions are very telling of their personalities. And of course I love them all! Is This Great Dane the World's Tallest Dog?